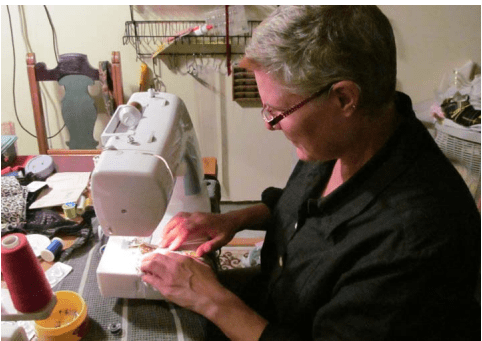 Lori Schumann loves to sew, and Lori loves to have fun. Skirtin Around by Lori is all about sewing up awesome and functional shopping bags, aprons, and now pillow cases and shams. Sewn mainly from re-purposed or upcycled fabrics, Lori’s creations are inspired by her talent for design and eye for unique and fun fabrics. In short, Lori’s bags and aprons are beautiful in their simplicity and functionality, while unique in their colors, patterns, and print. The Better Bag: Then, one day, Lori had an epiphany. 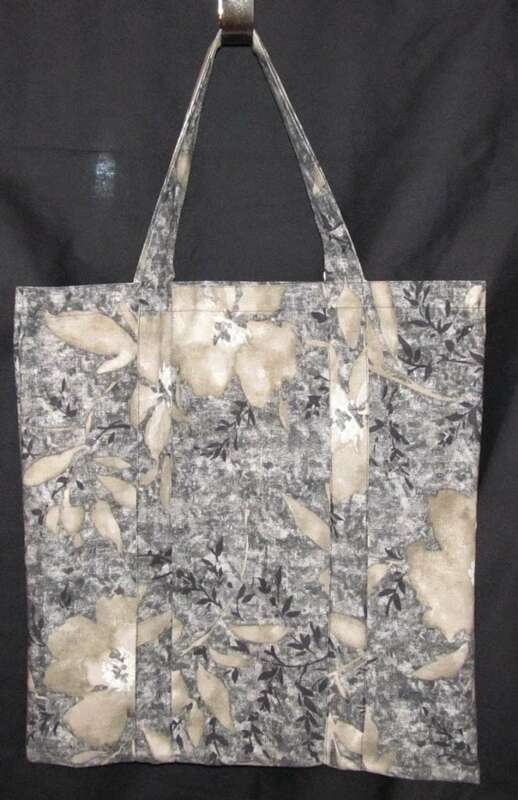 The news was full of stories of the coming plastic shopping bag bans, and Lori realized she could create a better shopping bag – a shopping bag that can be reused, a shopping bag that is functional, a shopping bag people like to use and carry around. So, Lori went to work. 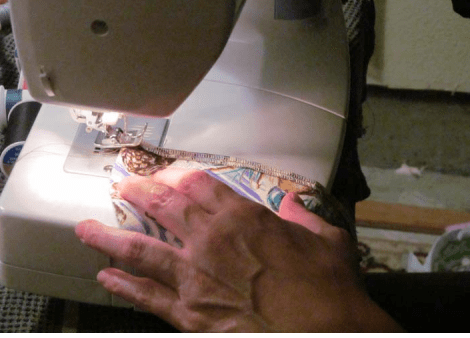 The Fabric of Design: Lori is choosy about the fabric. Of course, the fabric must look right. She hunts down great prints and patterns, brocades, and solids. She chooses fabrics for everyone’s taste and mood, such as florals, chickens, Hawaiian, leopard skin, and pin-ups. The fabric must be durable, like a brocade or twill. The variety is endless. Not Just Any Material: But Lori is also particular about the source. She wants to repurpose and upcycle as much as possible. She’s sewn bags with discarded scraps or from fabric that was liquidated from retailers. She also uses remnants. Her latest is to sew bags from old feed bags, and she’s thought of using sails. It’s obvious Lori loves to design and think of new ways to create shopping bags out of something no longer wanted. Aprons! 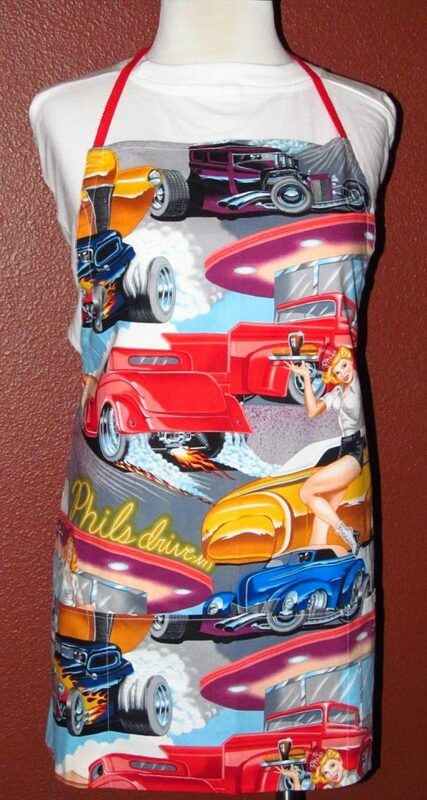 Not content to just create shopping bags, Lori also designs and sews aprons. Now, these aren’t the aprons your grandma wore to cook Thanksgiving dinner. I think Lori’s aprons are imminently more useful and lots more fun. Lori creates two basic styles: The full apron with pockets, and the bartender apron. It’s Fun in the Kitchen: The full apron has one ingenious design – the drawstring tie. This design makes the full apron a truly one-size fits all apron. The bartender aprons are just plain fun and useful, and very popular for the male chefs in your home. Both aprons come with pockets and, of course, are sewn with all kinds of fabric designs. Fair Play: For the first few years, Lori set up shop at many of the craft fairs and shows around the metro area. In some ways, Lori enjoyed the fairs. She’s very warm, generous, friendly and welcoming, and people just naturally flock to her. Lori explains that she’s met many wonderful artists and craftsmen/women working booths at these shows, and I’m sure she’s made friends with some of her customers too. On-Line Fun: However, it’s a struggle to sew enough inventory to have a great display, while also moving enough inventory to make the financial investment worth it. So, Lori is transitioning to selling her creations on-line at her website. The bags and aprons are very reasonably priced for a handmade product, and the price includes the shipping. Sunny Disposition: Despite growing up in Portland (or maybe because of it), Lori is a sun worshiper. She takes an almost annual tropical vacation and explores the underwater world by scuba diving. Lori also takes advantage of the summer sun by having an amazing garden of fruit and vegetables. Portland Rocks! But Lori also loves many things Portland offers. She loves the diversity of the neighborhoods. She enjoys the great food (and wine) found in all the neighborhood restaurants and bars. She takes advantage of the local movie houses and theaters. (Where else can you go to a movie and get a micro brew beer and pizza?). She even sings back-up for a local Led Zeppelin cover band. Shop! Check out her great bags and aprons at her website: www.skirtinaroundbylori.com. These shopping bags are like accessories, and the aprons are fashion statements. Why not have some fun?